WASHINGTON — Homeland Security chief Janet Napolitano and the Obama administration learned a valuable public relations lesson in this latest incident involving the Detroit terror incident: Don’t try to hoodwink the public with positive spin– at least not on something so obvious. Snow job. (Or in Clinton’s case, the other kind of job). Both had a cost: a loss of credibility. 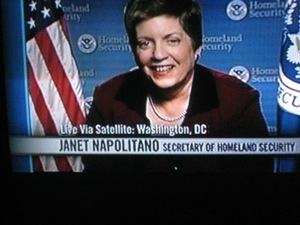 Sure, Napolitano backed off her statement and said it was taken out of context. She says she was referring to the response after the incident. And then President Obama stepped up to the plate on Tuesday and conceded that the system had failed. But some damage was done. You only get so many chances in this unforgiving town. Be careful how you use up those credibility chips. In many instances, once they’re gone, so are you. Posted: 12/30/09 at 8:50 AM under News Story.